In a water treatment plant, it goes without saying you want all the water running inside the pipes. But 20 years ago, Rick Adamson, general manager for the Adams County Regional Water District, was dealing with a problem he never expected: water — and tons of it — condensing and pouring off the outside of pipes inside a new, state-of-the-art facility in Manchester, OH. The problem: Warm, humid summer air — the seemingly default state in the Midwest — was blanketing pipes filled with cool groundwater, which caused unwanted water to condense throughout the facility. Plants with dense pipe configurations are especially prone to humidity problems. With a new $3 million plant online in 1999, serving about 7,500 taps, Adamson knew he had to find a solution — and quickly. The answer: four portable dehumidifiers placed throughout the plant. The result was a dry plant, nearly zero maintenance, and thousands of dollars saved. While Adams County Regional Water District quickly found a solution, many other districts and municipalities in the Midwest remain plagued with humidity problems in their water treatment plants — issues they’re currently trying to solve with much more costly and cumbersome methods than dehumidification. In and around the Midwest, particularly in states such as Michigan, Ohio, Pennsylvania, and Wisconsin, high humidity is a costly and time-consuming hazard when not managed appropriately. But before digging into those issues, it helps to understand why humidity and moisture are significantly more problematic in the Midwest than, say, the South, where it’s equally as humid. 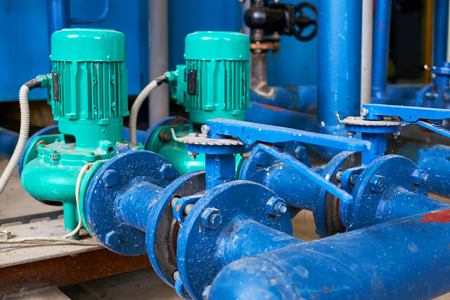 For starters, most water treatment plants in the Midwest pull their water from underground. In the South — and many other parts of the U.S. — drinking water is pumped from surface sources such as lakes and ponds. That matters because groundwater is consistently 55 degrees or cooler, while surface water is much warmer. When the cool groundwater makes its way into a water treatment plant during late spring, summer, and early fall when humidity is high, water quickly forms on pipes, floors, and other surfaces. One of my favorite analogies is a beer can sitting on a bench outside. The beer is below 50 degrees, and the dewpoint on a warm day is above 50 degrees, so the beer can sweats. That’s the same thing that happens on pipes running through hundreds of Midwest water plants each year. And in the Midwest, most plants I’ve visited aren’t air-conditioned. With 20,000-gallon tanks of open water, coupled with thousands of feet of pipes, it will be “raining” inside without humidity control. When that problem hits, it doesn’t take long for corrosion to take hold — an issue I’ve witnessed many times. 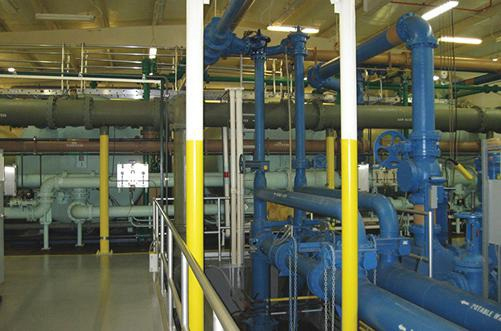 For Midwest water plants — or any water plant for that matter — the primary concern tied to high humidity is pipe corrosion. If condensation and high humidity go unchecked, pipes will rust at a rapid rate. Without humidity control, plant employees have to sand rust, paint pipes, and replace bolts annually, which is a drain on resources and budget. Preventing corrosion is the primary reason for controlling humidity. Keeping relative humidity at 40 percent during the hottest months of the year can eliminate the need for painting. Along with the pipes, corrosion does have a tendency to spread to other parts of plants. Dripping water can cause concrete floors to pit and break up, while consistently high humidity can cause sensors to malfunction. One of the most common reasons plant managers don’t use humidity control is the initial cost they suspect is needed to install dehumidifiers. A $50,000 capital project to install large rooftop units isn’t something many managers want to justify to their boards. Given that this is such a barrier for so many plant managers, I want to touch on it briefly. Often, portable commercial dehumidifiers make much more sense, both operationally and financially. Most portable units capable of keeping relative humidity at an optimal level cost anywhere from $3,000 to $5,000. And, most plants don’t need more than three or four units. But, the real beauty is the annual cost eliminated by controlling humidity. When managers no longer need to paint pipes each year, most can save between $8,000 and $10,000, plus staff time. While some water treatment plants aren’t staffed regularly, many have at least one employee on site 24/7 to ensure everything runs smoothly. For that reason, safety is an increasingly important issue for plant managers. High levels of humidity in a water treatment plant can cause electrical panels to arc, which puts staff at risk of electrocution or shock. Additionally, a humid plant leads to other safety issues, such as shattering lightbulbs.